Four recent news reports have thrown much more light on Narendra Modi’s controversial deal. If the Bharatiya Janata Party thought that the Supreme Court order last year dismissing calls for an inquiry into the Rafale case would put a lid on the matter, it was entirely mistaken. Since the verdict, which itself became highly controversial thanks to a “mistake”, details have continued to emerge that have raised even more questions about Prime Minister Narendra Modi’s decision to order 36 jets from France. First a recap: Modi made a surprise announcement in 2015 saying India would be buying 36 Rafale jets directly from France, instead of 126 fighter planes that the Air Force had formally been looking to purchase from a manufacturer. The deal was sold as proof of Modi’s decisive governance, with the BJP claiming that India would also be getting the jets for a cheaper price than had been envisioned under the previous government. First there was that price claim about how much the Rafale would cost, with the government suddenly refusing to give specific details. Then there was the matter of Dassault, the manufacturer, partnering with Anil Ambani’s Reliance Defence instead of the state-run Hindustan Aeronatics Limited and whether the Indian government had a role in this decision. Finally, there have been a series of questions about whether Modi broke protocol in the way the agreement actually took place. Reports over the last few weeks have offered additional material on all three of these aspects. The Hindu added to the body of reporting that has made it clear that the Prime Minister’s Office carried on parallel negotiations with the French side, even as doing so undermined the position of the official negotiating team. Indeed, this is spelled out in a file noting that spells this out:.“It is desirable that such discussions be avoided by the PMO as it undermines our negotiating position seriously,” said the note signed by former Defence Secretary G Mohan Kumar. The government has denied that the Prime Minister’s Office was holding parallel discussions on the matter. Prior to that, the Hindu had also explained why the price per aircraft had gone up significantly in the deal for 36 aircraft as against the one for 126. It reported that Modi’s administration had accepted a fixed cost of €1.3 billion for design and development of Indian Specific Enhancements, which when spread over 36 jets rather than 126 led to a much higher cost for each. This was accepted, despite objections from three of the seven members of the negotiating team. The government claimed that this report compares Modi’s deal to one that was being negotiated under the previous government, which was substantially different and so the price was not comparable. The Hindu’s N Ram then went on to report that critical provisions for anti-corruption penalties and making payments through an escrow account were dropped. The Defence Acquisition Council, headed by then Defence Minister Manohar Parrikar, ratified eight changes to the Inter-Governmental Agreement and associated documents in September 2016. One of these changes was a decision to drop clauses relating to penalties for undue influence or corruption, despite objections by some members of the negotiating team. Another saw the Centre dropping a requirement that payments made by India to France go into an escrow account run by the French government, making them responsible for releasing payments based on delivery by the French manufacturers. This itself was proposed because the PMO and National Security Advisor Ajit Doval chose to waive the need for a bank or sovereign guarantee from the French government, in lieu of a non legally binding letter of comfort. Even the escrow account stipulation was struck down. The government claimed that inter-governmental agreements frequently do not include provisions like these, so as to ensure the deal moves forward quickly. Finally, the Indian Express reported on Tuesday that, just two weeks before Modi made the surprise announcement about the new Rafale deal in 2015, businessman Anil Ambani paid a last-minute visit to the office of the French Defence Minister in Paris. The report, citing an official who was briefed on the meeting, said that Ambani mentioned a Memorandum of Understanding “in preparation and the intention to sign during Modi’s visit” to Paris two weeks later. Reliance Defence, which was eventually picked as Dassault’s “key partner” in fulfilling offset clauses arising out of the Rafale deal, was incorporated that same week. 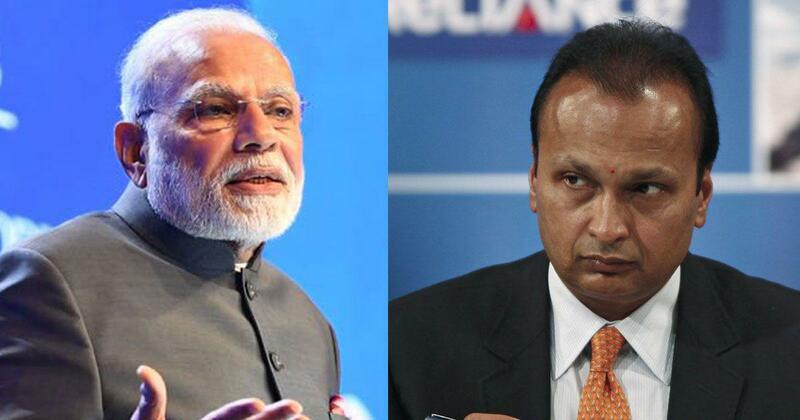 Former French President Francois Hollande has said in the past that the Modi government had proposed Anil Ambani’s name as a partner for Dassault. This charge, in fact, has not been denied by the Modi government, though it has insisted that Dassault was free to pick whoever it wanted to work with. The cumulative effect of all these reports is to raise even more doubts about how Modi’s Rafale deal actually came together. The latest story, in which Anil Ambani seems to be anticipating some major deal with the French two weeks before even the defence ministry was told about the Rafale deal, adds to the plethora of questions that now surround this controversial matter. In addition to these issues, the Finance Ministry was expected on Tuesday to table a Comptroller and Auditor General report in the Lok Sabha that looked into various Air Force acquisitions over the last few years, including a separate chapter on Rafale. 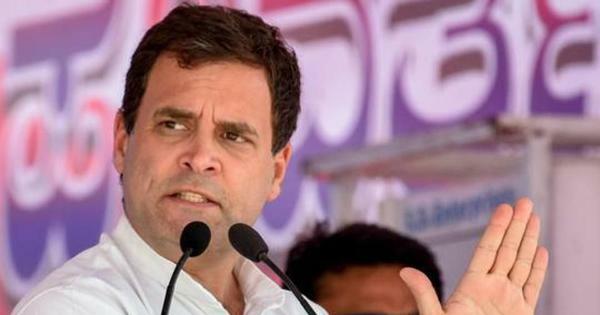 Expecting the report to skirt the question of both pricing and offsets, the Congress over the weekend attacked CAG Rajeev Mehrishi, saying he was finance secretary at the time of the Rafale negotiations and so investigating them would be a conflict of interest. More than anything else, this simply confirms that the Rafale controversy is not going anywhere. 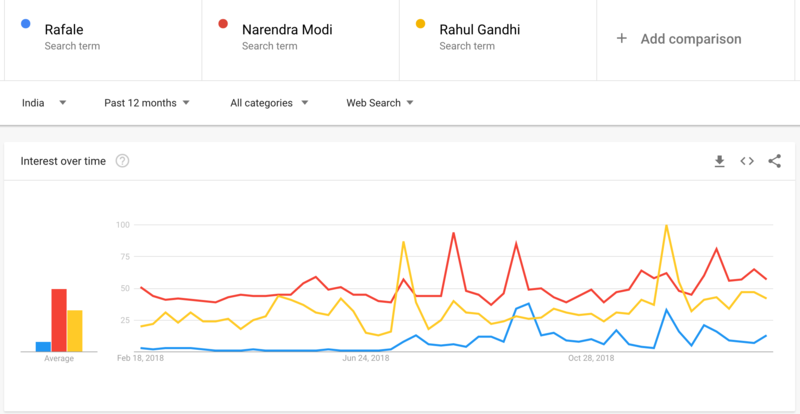 And, despite the general belief that there is little interest in the Rafale case in the general public, the government’s responses to the recent news reports – and the above representation of search trends – alone suggests that at least online there is substantial awareness of the controversy. Whether it ends up harming the BJP electorally may be another matter altogether, but it seems evident that, no matter what the political ramifications of the deal are, the public deserves more clarity on how it came to be decided. Rafale deal: Did Narendra Modi’s PMO interfere with negotiations over the jets? Rafale explainer: Is India paying more for the fighter jet than it would have under UPA? Rafale explainer: How are Anil Ambani and Reliance involved in the controversial deal?